53rd Croatian Children's Film Festival | News | Media culture is no longer an Achilles’ heel of Croatian language! Media culture is no longer an Achilles’ heel of Croatian language! 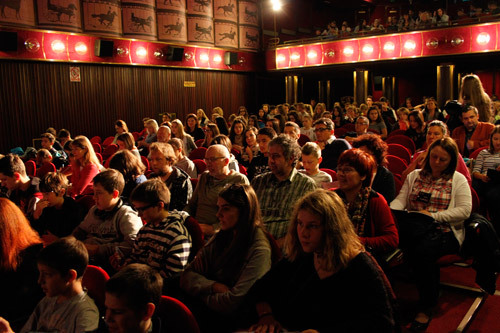 53rd Croatian Children's Film Festival is really a celebration of film and everything film connected and that was proved again yesterday. After three screenings at the Art-cinema Croatia, after more than forty films, international jury gave first grades. „Even if i didn't like some film, I didn't give it a 1 because other children worked really hard on it, I rather gave it a two.“, explained young member of the jury. Members of the Festival had a chance to go sightseeing in Rijeka and surroundings as well as participate in four workshops. Jura Troje though the children how to tell a film story in a minute, Marija Markezić moved their drawings, Diana Nenadić thought them how to become film critics while Leo Vitasović filmed movies in one shot. Mentors and teachers participated in the presentation of a workbook in media culture „Media Challenges“. Author, professor Marina Zlatarić, wanting to make the workbook different than anything else, presented all the units through workshops and games. Media challenges were created with the idea to help teachers of Croatian languages in designing their media culture classes, which usually consists only from a review of a watched film. Presentation was lead by the editor Evica Kalogjera with the help of a Children's ombudsman counselor Maja Flego and professors Melota Horvatek Forjan and Nataša Jakob. Evening was reserved for a feature film from Lithuania „Mom, I love you“which was shown at the 'theatre on a ship'. After film, young filmmakers got a new surprise – writing the film criticism. Author of the best review will win the participation at the video workshop for children and youth in Kraljevica next summer. Today we will see three new screenings of children's films; we will go on fieldtrips, workshops as well as the panel discussion. Since today is the end of the week, children and mentors can relax at the 'young disco' in the anticipation of tomorrow’s award ceremony.